Mercedes team-mates Lewis Hamilton and Valtteri Bottas agreed the start was key to deciding the winner of the Chinese Grand Prix. 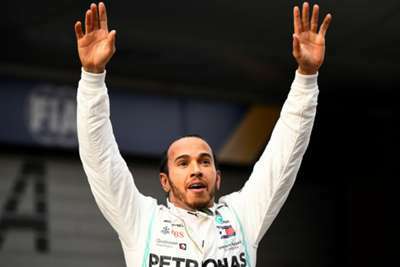 Bottas qualified on pole but was overtaken into turn one by reigning champion Hamilton, who cruised to his sixth win in Shanghai and the top step of the podium in Formula One's 1,000th race. The finish represented Mercedes' third straight one-two to start the season, making them the first team to achieve the feat since Williams in 1992. Hamilton was pleased to have come out on top despite Ferrari dominating during the free practice sessions and suggested he did not feel any pressure after moving past Bottas. "It's not been the most straightforward of weekends but what a fantastic result for team, everyone worked so hard," said the Briton in his post-race interview. "We didn't know where we would stand with the Ferraris, they were so quick. "Valtteri was quick all weekend to have the one-two is special on [the] 1,000th grand prix. I got a quick start and rest is kind of history. "The strategists were really on point in the first three races and we've got to keep it up." Bottas acknowledged his car was sluggish at lights out and it proved the deciding factor as he surrendered his place at the top of the drivers' standings to Hamilton. "I think I lost it at the start honestly. The car was feeling OK and otherwise the pace was similar," said Bottas. "In the dirty air I couldn't follow. It was a shame about start, got some wheelspin from start-finish line and I lost it there. "It's small details but it's early days in the season, things looking good for the team, three perfect weekends. "It's not a nice feeling so I'll come back strong."